NEW YORK, Aug. 30, 2018 – Two-time reigning WNBA Defensive Player of the Year Alana Beard of the Los Angeles Sparks leads the 2018 WNBA All-Defensive Team, the WNBA announced today. Recently named the 2018 WNBA Defensive Player of the Year, Beard received nine of a possible 11 All-Defensive First Team votes from a panel of the league’s head coaches. She earned her fifth WNBA All-Defensive First Team selection and ninth All-Defensive nod overall (including four Second Team honors). 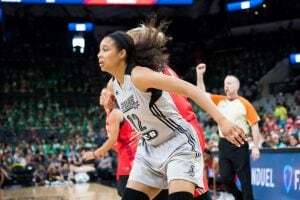 Beard (48 points) is joined on the WNBA All-Defensive First Team by Phoenix Mercury center Brittney Griner (41), Connecticut Sun guard Jasmine Thomas (41), Seattle Storm forward Natasha Thomas (37) and Atlanta Dream forward Jessica Breland (34). The WNBA’s 12 head coaches selected First and Second Teams by position and were not permitted to vote for players from their own teams. Players earned five points for each First Team vote and three points for each Second Team vote. If a player received votes at multiple positions, she was slotted at the position where she received the most votes. Alana Beard, Sparks: Beard was fourth in the WNBA in steals (1.47 spg) and helped Los Angeles finish with the league’s second-highest defensive rating. 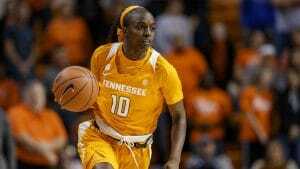 With 698 career steals, she ranks third on the all-time list. Brittney Griner, Mercury: A First Team selection for the third time, Griner led the WNBA in blocked shots (2.56 bpg) for the sixth consecutive season. Jasmine Thomas, Sun: This marks the second First Team selection in a row for Thomas, who also made the Second Team in 2016. Natasha Howard, Storm: The 2018 WNBA Most Improved Player and first-time All-Defensive selection ranked second in the league in blocks with a career-high 1.97 per game. Howard’s 67 blocks exceeded her total from the previous three seasons combined (61). Jessica Breland, Dream: Making her All-Defensive debut, the seven-year veteran was the WNBA’s third-leading shot-blocker (1.91 bpg) this season. Sylvia Fowles, Lynx: Now a nine-time All-Defensive selection, Fowles set single-season records for rebounding average (11.88 rpg), total rebounds (404) and total defensive rebounds (282). Tiffany Hayes, Dream: Hayes makes her first All-Defensive Team after joining Breland to help Atlanta lead the WNBA in defensive rating. Rebekkah Brunson, Lynx: An All-Defensive honoree for the seventh time, Brunson became the WNBA’s all-time rebounding leader this season. Nneka Ogwumike, Sparks: The 2016 WNBA Most Valuable Player and an All-Defensive First Team member from 2015-17, Ogwumike ranked third in the league in steals (1.56 spg). Ariel Atkins, Mystics: The seventh overall pick in the 2018 WNBA Draft finished ninth in the league in steals (1.34 spg) while starting 24 of the 29 games in which she played during her first season.